Coursework: Early American Novel, African-American Novel and the Law, Problems of Population in British Literature, World Literature for High School, Writing-Based Classrooms, Educational Technology, 800+ Internship hours. Coursework: Interdisciplinary Studies in Literature and the Arts, World Literatures, Modernist Writers, Gothic Traditions, Medieval Literature, Film Study. Coursework in French: French theater and literature at Université de Paris-8, Photography and video at École Nationale Supérieure des Arts Décoratifs (Arts Conservatory). Teaches English I and Foundations of English I. As intern, taught Literacy English I and AP English III with Jennifer Kleckner. Taught Blended Standard and Honors English I. Created arts-oriented curriculum. Acted as cooperating teacher for Appalachian State University student (2011). Taught Reading Remediation, Honors English II, and Standard English III. Taught and mentored high school students at various skill levels. Contacted parents and administrators. Collaborated to improve student experience. Teacher of the Year, 2008. Led educational tours of Frank Lloyd Wright properties to visitors and large school groups. Ensured understanding and safety of multilingual and multi-age groups of visitors. Conducted weekly discussions in English and French on language and culture with French ESL students at vocational high school. At the Language of Images conference. “Reinventing the Personal Narrative: Model It, Craft It, Publish It.” Presenter and Chair. National Council for the Teachers of English Annual Convention, Boston. November 2013. “Critically Thinking: Using Young Adult Literature and Wikipedia to Encourage Critical Stances.” Presenter. National Council for the Teachers of English Annual Convention, Las Vegas. November 2012. “Writing Wikipedia Pages in the Constructivist Classroom,” ED-MEDIA 2009 World Conference on Educational Multimedia, Hypermedia & Telecommunications, Association for the Advancement of Computing in Education. June 2009. “The Critical Eye,” The Language of Images Conference, CCSU. March 2007. “Critical Wars,” Symposium Magazine (April 2007). New Haven, CT: Yale University. FOLIO. Co-founder and layout design for independently-produced literary magazine. 2001-2009. Carrboro Free Press. Editorial consultant, layout design, and photography. 2009. Waiting in line at the Full Frame Film Festival 2011. Photo by Sherri Krueger, from Full Frame Documentary Film Festival flickr stream. 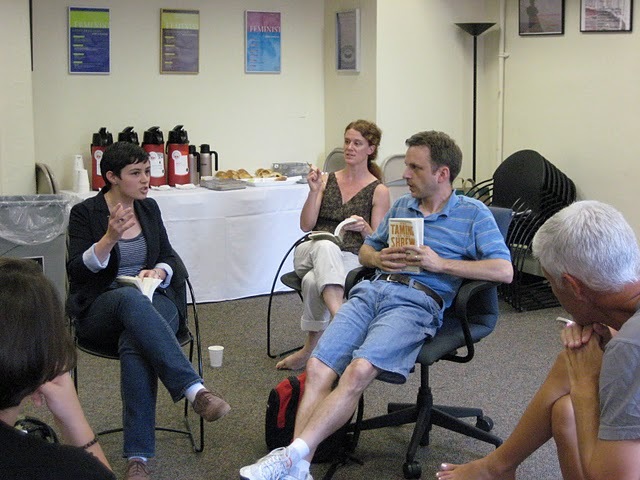 Five Powers of Poetry Workshop with Tony Hoagland. The Poetry Foundation. Chicago. July 2013. Participated in 3-day seminar on teaching poetry. Virginia Museum of Fine Arts Summer Teacher Institute. Richmond, VA. June 2013. Attended 2-day workshop focused on integrating the visual arts and art history in the classroom. National Council for Teachers of English Annual Convention Presenter. November 2012 and 2013. Selected in 2012 to present project on writing Wikipedia articles about YA fiction in the high school classroom to gain reading, writing, and troubleshooting skills. Read about the project in a 2010 guest column in the News and Observer by Duke professor Cathy Davidson. Selected in 2013 to present on the annual memoir publishing project. Full Frame Documentary Film Festival: Teach the Teachers, Durham, NC. April 2011, 2012, 2013. Selected to attend international documentary festival and related discussions with other Durham educators. Studied John Golden’s Reading in the Reel World, created documentary-based lessons, and spearheaded field trip to Full Frame’s educational screening of The Loving Story. Creative Nonfiction: Telling the Truth. Institute for Writing and Thinking, Bard College. July 2012. Attended week-long institute focused on teaching creative nonfiction, including personal essays and memoirs. Teacher Institute: Crosscurrents of American Art: 18th and 19th Centuries. National Gallery of Art, Washington, D. C. July 2011. Explored how early American paintings can be used to enhance the study of narrative, detail, and archetype. Shakespeare Institute. National Endowment for the Humanities. Columbia University, New York City. August 2011. Examined the idea of manhood in the plays Romeo and Juliet, Taming of the Shrew, and Henry V through intensive seminars led by Columbia professors and scene work led by Theater for a New Audience acting coaches. Preparing a scene from Taming of the Shrew. Photo courtesy of Carie Donnelson. Assessment for Learning Institute, Durham Public Schools. Durham, NC. June 2011. Attended information sessions about standards-focused planning, assessment, and grading. As a member of school leadership team, planned and implemented AFL in school-wide workshops. Spanish in the Classroom, Durham Technical Community College online. August 2010. Studied classroom vocabulary and basic grammar for communicating with students and parents. Worksheets Don’t Grow Dendrites, Marcia Tate. Durham, NC. June 2010. Participated in workshop on brain-compatible teaching and memory techniques. French culture and language (fluent), interdisciplinary education, magazine design and publication, gallery management, photography, theater and film, cooking. For educators interested in learning more about incorporating Wikipedia writing into their lessons, please follow this link. This site was originally started to document my growth as a student teacher in Duke University’s MAT program. Below you will find links to all elements of my original MAT electronic teaching portfolio, including sample lessons and units, student work, and statements of educational philosophy.